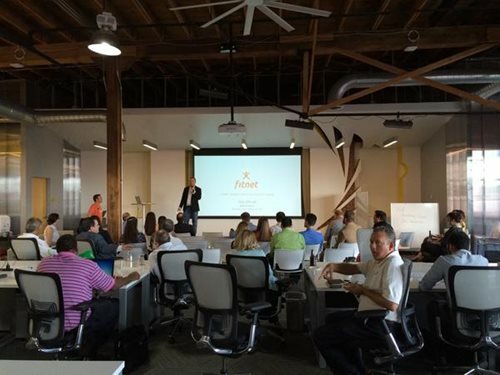 A crowd of 50 health care innovators from Kansas City and guests from the Midwest Health Informatics & Telemedicine Conference gathered on Aug. 20 at Sprint Accelerator for KC Digital Drive’s first Digital Health Innovation Forum. The use of technology to improve patient care and launch business ventures is not unique. But today’s entrepreneurs are noticing new business opportunities and are pursuing health care start-ups that use technology. Healthy Hawks at the Department of Pediatrics at the University of Kansas Medical Center has been helping Kansas City families overcome issues related to weight loss since 2004. The current project, a Mozilla Gigabit Community Fund award recipient, Tech Hawks integrates videos with the Fitnet health application for Apple IOS. It allows families to engage in virtual, interactive and nutritious programs with on-demand video exercises delivered in home via LTE enabled tablets. Bob Summers of Fitnet demonstrated his technology at the Innovation Forum. “Whatever can be delivered by video can be delivered by Fitnet,” Summers said. “There are 30,588 health and fitness apps for Apple IOS, according to Summers. We know people will use their smartphone apps and are held accountable by this technology, he continued.” The Fitnet and Healthy Hawks project can be followed at fit.net/hawks. Children’s Mercy Hospitals and Clinics in Kansas City is the only hospital in the country to feature the fully immersive telepresence tool SightDeck. Morgan Waller, BSN, MBA, RN, director of Telemedicine Professional Services at Children’s Mercy, also presented her project to Innovation Forum attendees. Waller discussed the collaboration between CMH and SightDeck that provides health care over distance via 2D, 3D and HD video in a unique way. “It uses green screen technology,” Waller said. While the technology is not new, it is new to health care. The system layers video, voice and graphics to send presentations. Waller said a mobile component provides real-time collaboration. Steve Fennel, director of development in Administration and Telecommunications Outreach at the University of Kansas Medical Center presented his pilot project to create a usable and affordable application for in-home monitoring for caregivers of dementia patients. “In 2013, 15.5 million families and friends provided 17.7 billion hours of unpaid care to those with Alzheimer’s and other dementias,” Fennel said. By applying telehealth tools to behavioral health applications, KUMC and Fennel are joining the charge to develop next-generation apps for digital health. Rounding out the Digital Health Innovation Forum was Kevin Sparks, chief strategy officer with Blue Cross and Blue Shield of Kansas City. As the largest insurer in the KC region, Sparks said Blue Cross and Blue Shield is in a good position to look into the future of digital health. Looking at projections, Sparks said the senior population will drive the growth in health care. People are living longer. Knowing that, Sparks said examination of health care today needs to address chronic conditions such as obesity and chronic illness; regulatory and cultural barriers; and marketplace barriers. One of the largest barriers is cost. Sparks pointed out consumers are not always the payers. “When you have to pay for things, you have a concern,” he said. But there are areas of innovation that can address these concerns. Sparks asked the question, “Is health care ripe for innovation and entrepreneurship?” If the projects presented Aug. 20 are an indication, the answer is likely to be “yes.” He said fitness apps such as Fitnet encourage healthy lifestyles by using technology to hold individuals accountable. The app also provides metrics for assessing improvement in health. Reimbursement for health care technologies is also an area that needs to be addressed. But now that employers and health plans have integrated preventive care, insurers such as Blue Cross and Blue Shield are paying attention to technologies such as the ones presented at the Digital Innovation Forum. There’s no quick and easy answer to how the insurance industry will handle digital health, as Forum attendees learned. But with the growth in funding opportunities and more entrepreneurs interested in pursuing health care start-ups, insurers will continue to look into the future of health care innovation and entrepreneurship. The Digital Health Innovation Forum was sponsored by REACH Healthcare Foundation, Kansas City Area Lifesciences Institute, Inc., and Sprint Accelerator powered by Techstars.